Whenever Hua Xiong is damaged by either a red attack or an attack with wine, he must reduce his maximum health level by one unit. If Hua Xiong is damaged by a red Attack with Wine, he only reduces his maximum by one through "Reliant on Valor." Note that "Reliant on Valor" is enforced. Hua Xiong cannot 'turn off' this ability. Hua Xiong has six (!) units of health. This gives him a surprising amount of longevity. If he is at full health at the end of his turn, he can hold six cards. Because he has six units of health and can hold more cards than the normal player can, he can survive longer than one would probably expect, as the extra hand cards can be used by him to prevent additionally instances of damage. With the extra space in his hand due to his increased health, he can hold Peaches for weak teammates. This is quite useful late in a game. Because Hua Xiong is robust and does not have any offensive abilities, other players may ignore him, giving him even more longevity. "Reliant on Valor" leaves Hua Xiong extremely vulnerable to red Attacks and Attacks with Wine. When Hua Xiong reduces his maximum health level, he loses his only advantage against other characters. Other than holding Peaches in his hand, Hua Xiong has little he can add to a team situation. 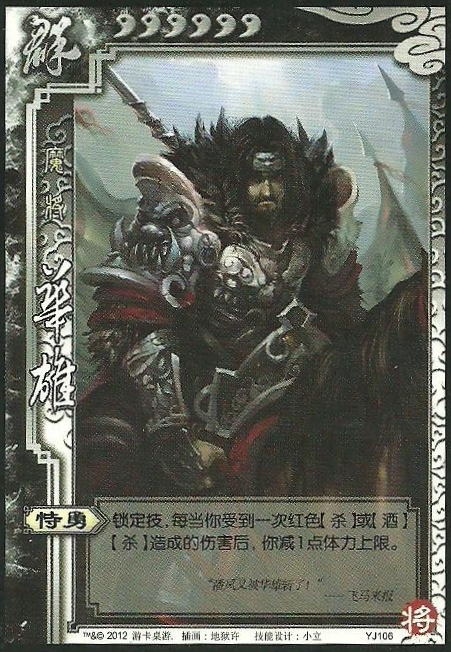 Xun Yu- Xun Yu's "Eternal Loyalty" can be used to refill Hua Xiong's hand to five cards if his maximum health level has not been reduced lower than five. This is significant, as most other characters can only be refilled to three or four hand cards. Xiao Qiao - Xiao Qiao's "Fantasy" allows her to pass damage to Hua Xiong and allow him to draw X cards, X being the number of units of health that he is missing. Because Hua Xiong's health limit is so high, he can draw many cards from this ability. However, Xiao Qiao can also be a formidable enemy. Her "Beauty" turns her spade-suited cards into heart-suited cards. This makes her spade-suited Attacks become heart-suited Attacks, so she can easily exploit his weakness provided by "Reliant on Valor." Guan Yu/Guan Xing & Zhang Bao/Zhao Yun/Demigod Guan Yu - These characters have abilities that provide them with many red-suited Attack cards. They can do a lot of damage to Hua Xiong. King Hua Xiong is a bad king choice. He is best when he is not the center of attention. Loyalist Hua Xiong is a serviceable, but not outstanding loyalist pick. The loyalist must actively help the king, Hua Xiong does not have many ways of doing this other than holding extra Negates and Peaches in his hand. However, he is difficult to kill and should be able to stay in the game for a long time to fight the rebels. Rebel Hua Xiong is a good rebel pick. His extra cards can be used to help his team and he will likely be able to survive for a long period of time despite having a three-card bounty on his head. Spy Hua Xiong is a serviceable spy pick. With so much health an no reward for killing him, he should be able to last for a long time. However, one weakness is that he might not be able to influence the game quickly if one side gains an quick advantage. 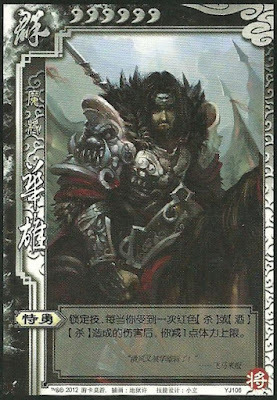 Before giving our final thoughts one this character, we have a question for the designer of this card: is it really necessary to have yet another character that was designed specifically to be weak to Guan Yu? First, we had Yan Liang & Wen Chou, then we had Yu Jin. Hua Xiong is the third character that was designed to fall prey to Guan Yu. Enough is enough. We all know that Guan Yu kills Hua Xiong in Romance of the Three Kingdoms, but historically, it was actually Sun Jian that deserves the credit. It is too bad that the character ability of Hua Xiong does not show a weakness to Sun Jian's "Brave Spirit." Anyway, when using Hua Xiong, it is necessary to keep a low profile until you are 'set up.' Do not reveal your role on the first turn. Also, try to acquire as much equipment as possible. Hua Xiong does not have any character abilities that give him an advantage when trying to kill other characters, so play defensively to outlast your enemies.